It’s hedging season and the volume of rootballed and bare-root hedging going out of the nursery is both incredible and a delight to see. 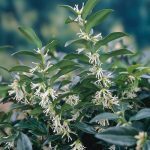 We have a large range of hedging varieties and sizes to cater for all needs from rural options to city gardens and everything in between. Out two most popular hedging options at this time of year are actually the most diverse; laurel hedging is fast growing, evergreen and dense, it is great for privacy and create a solid boundary quickly but does take up a reasonable amount of space, width wise and if you only have a small space, maybe in a front garden then it can eat into that space a little too much. The other popular option is Beech and in contrast it is deciduous, slow growing and takes a while to get established into a hedge but when it does it is beautiful especially at this time of years when it has the range fo colours from yellow to bronze and it does hold onto some of those leaves through the Autumn and winter months, giving you a reasonable amount of coverage and if you an afford to be patient it will be worth the wait. The upside of Beech hedging against the evergreen options is price, at only €1 per plant at two to three feet tall it is a much cheaper option than the €12.50 for the Laurel at the same height but you will need at least twice as many of the Beech. As a guide at that kind of height we advise 3 to the metre of Beech hedging planted in a single row or 5 to the metre if you prefer a wider double row planting. For the laurel option then you can get away with 1.5 per metre but 2 to the metre will be a better job. The next size up though will most definitely be planted at the 1.5 per metre spacings. Don’t discount however lots of other options and varieties available for your garden, some widely used options like Photinia Red Robin, Portuguese laurel, Grisselinia, Privet and Yew which are all available in rootballed options or Hornbeam, whitethorn, blackthorn as well as Viburnum opulus, rosa rugosa as a mixed native hedge, which can be beautiful in its naturalness all available bare-root and to be honest as cheap as chips but not really suitable options for town and city gardens. The reason some of the options are bare-root and some rootballed is because evergreen plants don’t survive well bare-root, you may see options available in small sizes but I stopped selling most evergreen hedging plants bare-root some years ago as the success rates at these sizes can be hit and miss. 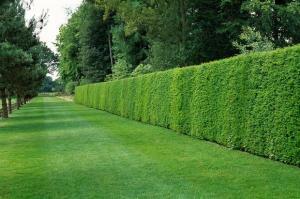 If the sizes are small enough then it can be a cheaper option and we do have some of these like smaller Yew and Box hedging. Hedging comes in such a wide range of sizes these days from the smaller 2 – 3 feet options (smaller again for things like the box hedging for which 8-10 inches is a normal enough size) through to some amazing plants for screening and privacy and instant maturity at 8-10 feet tall,for more ideas on these sizes then take a look at our video where Ian gives you an idea of how mature our plants look. 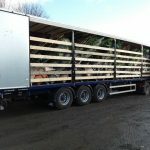 We grow a good deal of our hedging plants not he nursery in Caragh and source some items that we are missing almost always within Ireland at satellite growers so we can be assured of the quality of the hedging plants quality and to ensure that we always have the quantity we require, when we need them.